Advantages: Superb artwork, sheer number of triplane photographs; many multi-view photos of specific subjects; some misconceptions corrected; high quality stock. Disadvantages: Sloppy captioning, some myths perpetuated. The Fokker Dr.I is one of the most recognizable aircraft to have flown in WWI. For a period it was Germany’s best fighter, it’s reputation enhanced by the Aces that flew it. Although slower than contemporary fighters, it’s manoeuvrability made it stand out from the crowd. Its pilots were seemingly able to engage and break off combat at will. The type was troubled by careless manufacturing practices as well as Anthony Fokker’s desire to skimp on materials where he could. This lead to a compromise in the aircraft’s structural strength, which was to reveal itself only a few weeks after the type entered service. Several wing failures led the triplane to be grounded until modified replacement wings could be manufactured. In all, only 320 triplanes were made, mainly due to the imminent production of better fighters. The Fokker Dr.I has fascinated historians over the years, but accurate information on the subject has been hard to sort out. This isn’t helped by the lack of a complete surviving example. Most of what we know about the airframe itself comes from a report written by the British after they captured Fok.Dr.I 144/17. It is therefore with great expectation that one opens a book on a subject where the author has had a life long interest. I remember reading one of Paul Leeman’s articles on the triplane in an issue of Airfix magazine dating back to July 1969. A lot of new information has come forward since then, some of it dispelling old myths, some of it adding to the confusion. This book attempts to cover all aspects of this aircraft as well as the early exploits of Anthony Fokker and his Company. It does this on 224 pages of high quality stock, which is divided into ten chapters and the obligatory appendices. The photo reproduction is good with many prints being clearer than the same negative in other publications. Predictably some of the images are frustratingly small but this is understandable, as having them all in a large format would have increased the size of the book and made it prohibitively expensive. Credit must also be given to the publisher for allowing the printing of some “poorer” quality photographs. In these cases they are all we have of some fascinating aircraft that would otherwise not reach the public and be known to only the “historians”. Besides the usual chapters on development and deployment, there are some interesting excerpts from the diaries of Jacobs and Tutschek about flying the triplane. A British perspective is also given where we get the account of how Voss was able to cause mayhem before his demise. A useful chapter on construction follows where ample use is made of detailed drawings. These correct some, but not all of the misconceptions found in previous works. There are chapters on pilots, finishing, unit and individual markings with one of the best ideas being a section that contains a collection of Jasta “flight line” photos. Having gotten the bouquets out of the way, there are some parts of the book that disappoint. Sadly there are numerous captioning errors and myths hidden in the text. Some should have been picked up in the proof reading stage, others should not have been written at all. Page 26 – Sadly the myth about Platz being the designer at the Fokker factory is perpetuated here. This information comes from the long discredited book written by Weyl called “Fokker – The Creative Years”. Page 38 – This is definitely not FI 102/17. Comparison of the streaking to known pictures of FI 102/17 prove this. Similar comparisons to FI 103/17 show that it is more likely FI 101/17. Page 50 – This is actually Manfred von Richthofen about to take off, not Voss. Page 70 – The starboard side access panel was for the oil pump, not the magneto. Page 74 – Did MvR’s dog really answer to “Max” when his name was Moritz. 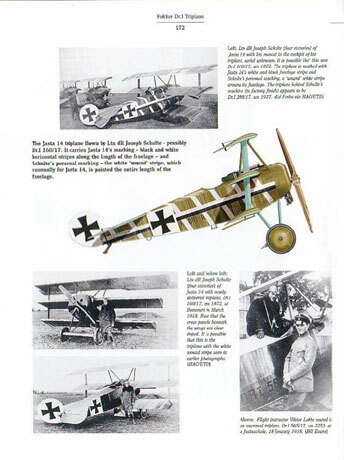 Page 76 – Jasta 32 did not have triplanes allocated to it and those pictured are from Jasta 36. The original mistake with identification could possibly have been due to the Jasta 32 pilots in the photograph. Page 103 – The underneath of the triplane axial wing did not have what appears to be six attachment points. This area was in one piece. Page 116 – The main throttle was on the control column, not on the inner fuselage structure. Page 133 – The inserted photo is obviously not MvR’s “all red triplane”. A quick look at the struts and fuselage marking show this. The Jasta 6 square magneto access panel is also a “giveaway”. Even more surprising is that this same photo is reproduced on page 70 with the correct Jasta 6 caption. Page 143 – Baumer was killed during a test flight (doing “aerobatics”) in a Rohrbach Rofix fighter on 15 July 1927 in Copenhagen. Franks, Bailey and Guest explain this in “Over the Lines”. Page 148 – Alex Imrie explains why this marking is red and not black, in “German Fighter Units June 1917 – 1918”. It was his family coat of arms. Page 137 – Once again these triplanes are from Jasta 36, not Jasta 32. Strange captions indeed as the book itself does not even mention Jasta 32 in its chapter on triplane distribution. Page 155 – Surely the missing paint below the cockpit identifies this triplane as 425/17. Page 174 – the pilot is obviously sitting in his Fokker D.VII, not a Dr.I (check the top wing). Page 175 – again a Fokker D.VII is misidentified for a triplane (note the engine side panel). Unfortunately there are many more such errors, with text also suffering from the misspelling of place and pilot names. There are times when the order of the triplane photos becomes frustrating. For example it would have been nice to have all the photos of Baumer’s 204/17 on the one page instead of having them distributed over pages 78, 143, 144, and 165 (flight line photos excluded). That way a particular aircraft can be studied more easily. Maybe organizing them in ascending Jasta order would have been a better option in the “main deployment” or “markings” chapters. One of the highlights of this book is undoubtedly the colour profiles by Harry Dempsey. As expected from this illustrator, we don’t just get a generic streaked aircraft to which the individual colours are applied. An effort has been made to copy the appropriate pattern and details relevant to each machine. Most of these profiles have been published elsewhere but there are still some new offerings to delight the reader. 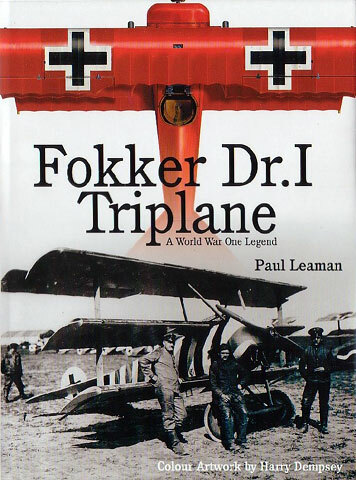 The main strength of this book lies in the sheer number of Fokker Dr.I photographs. To have so many images published in the one title is every enthusiast’s dream. Naturally many have been seen before but there are plenty that will be new to the majority of readers. In a lot of cases there are alternate views to aircraft that that have long since only had their “best side” published. This is surely a boon to modelers! The lavish presentation of the material in the book will lure many new advocates to the triplane. Unfortunately some of the information will lead them astray so other publications for cross referencing is a must.